Luxury Island Home, Close to everything, pool, parking, beach chairs & 7 bikes! MY VAC. RENTAL SUSTAINED NO DAMAGE FROM HURRICANE IRMA. ITS DOING FINE AND READY TO ACCOMMODATE GUESTS. OUR CONDO COMPLEX IS FINE TOO AND WE ARE READY TO RECEIVE GUESTS. PLEASE MAKE YOUR RESERVATION. We're less then 1/2 mile outside of Key West and only 4 1/2 miles from Duval Street, located in Stock Island. We are 2 miles from the beach, 1/2 mile from the airport. 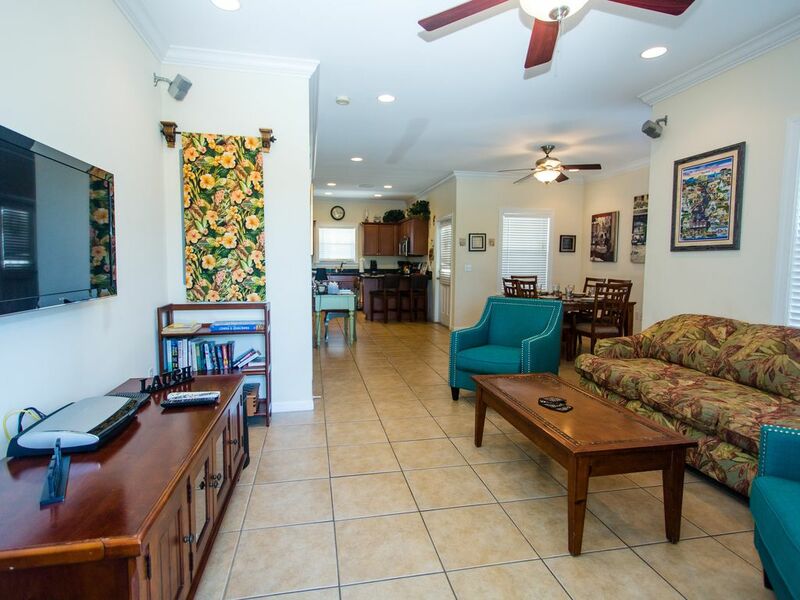 Our condo is in a very nice gated community with only 52 units that boasts a beautiful heated pool, lush landscaped grounds, fitness center, and clubhouse. Our unit provides covered parking too. We also have trailer parking available whether its for your motorcycle, jet ski or boat (off property). We're across the street from the ONLY 18 hole championship public golf course in Key West. Golf club rental is available from the pro shop. We can accommodate your trailer by offering off site trailer parking, safe and convenient. So bring your boat or bring your motorcycle or jet ski because we can accommodate all of them. We are located right next to a brand new CVS, a convenience store, bank with ATM, Burger King, liquor store and walking distance to many restaurants that are favorites with the locals including the brand new Roostica Pizzeria, Hog Fish Bar/Grill on the water, Hurricane Hole Marina/Bar/Grill on the water, Rusty Anchor, El Mochos Cuban Cafe, and Chicos Cantina. You don't have to drive to try great local seafood specialties and enjoy a cold beer or cocktail, just stroll or bike to any one of these and you won't be disappointed. Get some hot cuban bread and a cafe con leche in the morning at El Mochos but don't forget they offer great lunch items too. They are just a short walk away from our condo and don't be surprised if you find yourself returning every morning or lunch time for more. Our complex is located along the local city bus transit route which comes by every 1/2 hour, offers transit to all parts of Key West (old town, beaches, and new town) and is economically priced at $8.00 per person for a weekly pass. We are less than 2 miles from the airport, beaches, shopping and Publix/Albertsons, Denny's, movie theater, Outback, Quiznos, Subway, Kmart, Sports Bar, and Sears. Decorated in Key West style to give our guests the full impact of island living, we offer a home away from home with thoughtful touches. Our condo offers 1100 sq. ft of spacious living plus two covered porches. It has 2 bedrooms upstairs, each with cathedral ceilings, queen bed, private bath with granite countertops (master has shower with body jets, guest room has Jacuzzi tub), T.V. with remote control, 500+ count cotton sheets and duvets with down comforters. We provide all of your linens and beach towels. There is also a full size front loading brand new washer/dryer tucked away in the hall in between bedrooms. The kitchen has granite counter tops with stainless appliances and is fully stocked. The living room has a queen sofa sleeper and a brand new 42' SONY LED TV with Bose surround sound and a DVD/CD player. We have a DVD library to entertain all ages and board games too. The master bedroom and living room have double French doors that open up to a covered balcony with patio furniture and ceiling fan and light. The kitchen and living room are downstairs. Our dining table comfortably seats 6. We offer FREE WIFI (wireless internet) plus free local and long distance phone calls anywhere in the USA, Canada or Puerto Rico. We have an additional 370 sq. ft of covered storage area below our unit that has 7 really nice bikes with 3 locks, 3 coolers, gas grill with cooking utensils, beach umbrella, 4 back pack style beach chairs and 2 click and fold chaise beach chairs and tons of storage for any gear you may bring (golf clubs,fishing poles, baby stroller,etc...),keeping it out of the way but secured. There is a wonderful bike path located across the street that takes you right into Key West, so a bike ride into town to sight see is a must. Baby furniture (crib, high chair, stroller, etc...) is available for rent with advance notice and the items will be set up waiting for you when you arrive. I will also be your personal concierge, making any reservations you need during your stay. I have lived here over 40 years and I know just who to call for just about any adventure. I also keep discount promotion cards at my condo just for you that offer drink and meal discounts from many local restaurants and bars. We can provide more coupons upon request too. Keywords: Vacation Key West, Vacation rental key West, Vacation Home Key West, Key West Vacation Home,Luxury Condo, Key West vacation rental, Florida Keys Vacation Rental, Key West condo, Vacation rental by owner, covered parking, heated pool and fitness center, trailer parking, grill, spacious, Key West, concierge, discount coupons,restaurants, boating,kayak,jet ski, trailer parking. Hi, I have lived in Key West since I was 5 years old, attended elementary, jr. high and graduated from Key West High School in 1985. I attended our local community college also and then left for Tampa and attended USF. I eventually moved back to KW. I am pictured here with my Czech boyfriend of 15 years. I have 3 sons, my youngest attends KWHS and the older two live in Tampa, and a sister and 2 brothers that also live here. My family started several businesses when I was very young that instilled a strong work ethic in myself and my brothers and sisters. I come from a large family with 8 children (4 boys,4 girls--yes we're Catholic)ha ha. I am the youngest daughter, 7th in line. All of my brothers and sisters, regardless of age had a job in our family businesses. It was great. My sister is a nurse at our local hospital, my two brothers are cabinet makers. My boyfriend owns a local moving and labor business. We love Key West, the small island life and the tropical weather for sure. We stay active in local sport leagues (co-ed softball, inline hockey, beach volleyball, boccee, tennis)and love to bike ride around the island and go out on the boat. The theater and outstanding local talent found on our island makes Key West a really unique place. We love to attend the frequent artistic events held annually. We appreciate the quality of life that we are blessed to have living on an island with such a diverse/caring/and generous community. There truly is no place else like Key West. Key West is a popular vacation destination. The weather in the winter months is to die for and the year round events that have made Key West so popular are very inviting for everyone. Key West has so much to offer on our 2 x 4 mile island... from great theater productions, to art galleries, cabaret shows, live entertainment from local bands as well as invited notable guests, museums, historical attractions, fishing, boating, the beaches, shopping, and beautiful floral and fauna to see. You can get anywhere on a bike and you escape the hustle and bustle of big city life. Yet Key West does not lack action and the big events you typically find in bigger cities. Some of our festivals are world renowned. So who wouldn't want to vacation to Key West. That's why i bought my vac. rental property. 7 bikes with locks are included with your rental as well as 3 coolers, beach umbrella, beach chairs, gas grill with grill cooking utensils and pool floats. We offer covered parking at our unit as well as additional general parking and we can accommodate trailers upon request. Our complex boasts a huge heated pool, beautiful clubhouse with fitness center and lush landscaped grounds that are meticulously maintained. I have free WIFI, free long distance in USA, Canada and Puerto Rico. The condo is all new and fully loaded with everything you need. The kitchen and baths have granite counter tops. We have all new stainless appliances, washer/dryer, jacuzzi tub and shower with European body jets. The entire complex is very new and close to many conveniences such as a bank with ATM across the street, sandwich shop, Burger King, liquor store, convenience store, Mexican restaurant all within walking distance. We also have a great bike path across the street that takes you right into Key West. We are a stones throw from several local hangouts including the 'Hurricane Hole Restaurant/Bar/Marina' and the 'Hog Fish Restaurant/Bar', the 'Shrimp Shack Restaurant/Bar' (bars/restaurants) and several full service marinas on the Ocean. 2 miles to Smathers Beach. Take our bikes that we provide free for our guests and see the island. We have a terrific bike path that takes you to the beach, downtown, and all over the island. Duval is only 4 1/2 miles away. Several marinas nearby so ocean is not very far away. Public boat ramp walking distance from unit. Access to Gulf and Atlantic from ramp. Trailer parking available upon request. 1 covered designated space under my unit is available as well as additional general parking within complex for additional vehicles available. Clubhouse with fitness center and there is a TV in fitness center to watch while working out. 42' Sony LED with Bose surround sound and all the sports channells. Kayak rental/Paddle Board rental walking distance at the Hurricane Hole Marina. I'll be happy to make your reservation. 7 BIKES PROVIDED FOR OUR GUESTS FREE. 3 BIKE LOCKS INCLUDED TOO AND SOME OF THE BIKES EVEN HAVE A BASKET FOR EASE OF TOTING PERSONAL ITEMS. Boat rental available walking distance at the Hurricane Hole Marina. I can make your reservation. Less than 1/2 mile away is our only 18 hole Championship golf course. SMOKING PERMITTED ON OUTSIDE PORCHES ONLY!! Beautiful property. Next to bike trail and bikes are provided. Very nice pool. Home is well stocked, clean, tastefully decorated. Large outside balconies, great for morning coffee. The location is awesome. I heard comments about the noisy highway, which is true. But we weren’t in the house all that much, because the swimming pool was just a few minutes walk. We learned that the seven bikes, beach towels. & chairs and coolers weren’t in all condos. We made good use of these extras that were in the condo. The location is close to Key West by vehicle, walk or bike’s. We loved our stay and it would come back to this rental if we’re back in the area again. Love Stock Island. Really loved Tee by the Sea. Can’t wait to return. Beautiful place. Had everything we needed including great weather. Thanks Judy. Everything was great. A seamless and enjoyable experience. Just what an Airbnb should be. We enjoyed all the things Key West. Condo was very clean and well stocked with cooking pots and pans. The pool was a beautiful area that we really enjoyed. Very clean and safe community loved all the extras such as the grill and bikes. We arrived early and Judy was very accommodating. Would Definitely Return! I offer concierge service for any kind of adventure... from snorkel trips, sunset cruises, deep sea charter trips or a kayak/paddle board rental, jet ski, para sailing. They are all very close by and I can take care of it all for you. The condo is located walking distance from many of these adventures and so much to do. Restaurants are plentiful as well right near the condo, so no need to drive and hunt for parking downtown. So much to do and see from our place without the hassle of finding parking or late night noise from the bars downtown. Any stay over 7 nights will be figured as the weekly/7 night rate plus the nightly rate for shown for less than 7 nights . $150 cleaning fee Rates are subject to change until reservation is confirmed Must be 25 or older to rent and staying in the unit.